Independent Decorative Arts Scholar Betsy Davison, author of The Furniture of John Shearer, 1790-1820: “A True North Britain” in the Southern Backcountry, is currently working on a book about John Spitler (1774-1837), a furniture decorator from eastern Shenandoah (now Page) County, Virginia. Tentatively entitled Shenandoah’s Page Valley Style: The Painted Furniture of John Spitler, 1790-1806, the book is being published by the University of Georgia Press, with a release date of Spring 2020 to accompany an exhibit opening at the Museum of the Shenandoah Valley in Winchester , VA. Davison has given several lectures on John Spitler with more planned. The Furniture of John Shearer compiled Shearer’s known fifty-two pieces for the first time, cataloging in detail the thirty-two that she was able to examine. The remaining pieces are recorded in the book with old photographs, thanks to MESDA’s extensive research files. Since the book was published in January 2011, Davison has lectured widely on Shearer’s message-laden furniture and the new pieces that have turned up since the book’s publication. She continues her search for the singular piece that might finally reveal this enigmatic craftsman. Branching out from Shearer after attending a conference, Davison’s research for her online article Research Note: Scottish Bedroom Tables from Scotland to the American South, published in the October 2014 Journal of Early Southern Decorative Arts, began when she learned that John Shearer made this Scottish table form . This is a second career for Davison. 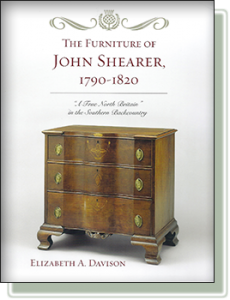 She wrote her master’s thesis on John Shearer while pursuing graduate studies in the History of Decorative Arts and Design at the Smithsonian/Parsons The New School of Design in Washington, D.C. Graduating in 2009, she guest-curated the exhibit ‘A True North Britain:’ The Furniture of John Shearer, 1790-1820 which ran at the Daughters of American Revolution (DAR) Museum in Washington, DC, October 7, 2010-March 4, 2011 and at the DeWitt Wallace Decorative Arts Museum, Colonial Williamsburg, April 2, 2011-March 5, 2012.